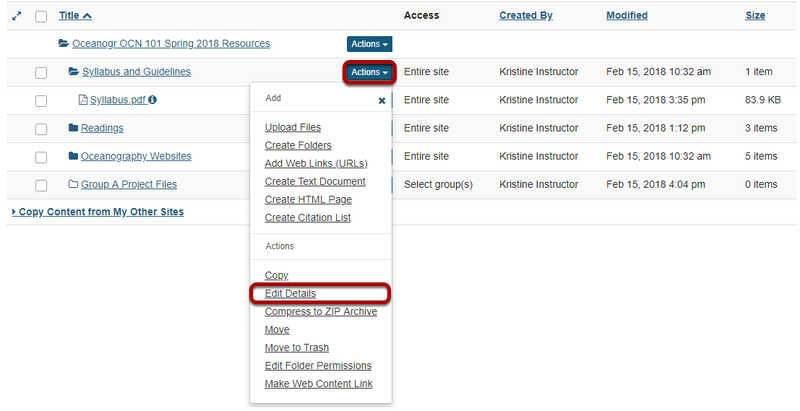 Sakai Community DocumentationSakai 19 User Guide (English) ResourcesHow do I make a file or folder publicly viewable? 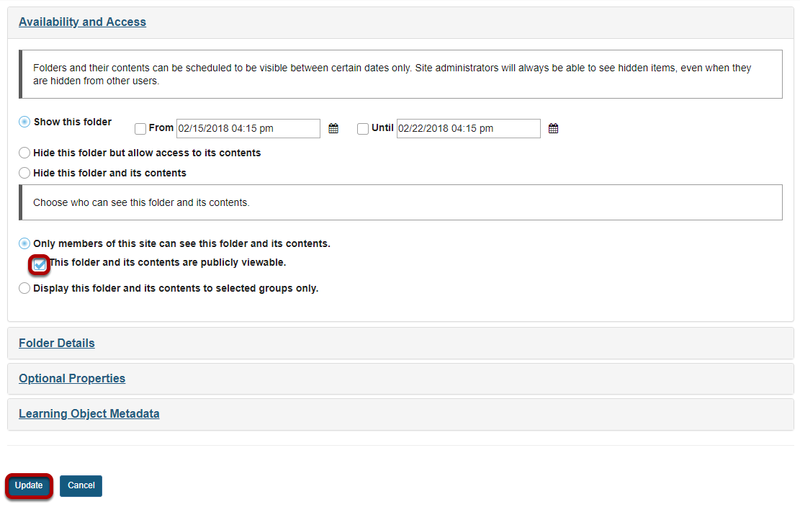 Site owners can make a file or folder publicly viewable. This means that the file or folder can be viewed by anyone with the file or folder's URL, even if they're not members of the folder's original site. Some institutions also have a "Search Public Course and Project Sites" button on their gateway page that will allow publicly available files and folders to be searched and viewed. To make a file or folder publicly viewable, to the right of the file or folder, from the Actions drop-down menu, select Edit Details. Make item public, then Update. Zoom: Make item public, then Update. Under Availability and Access, select the radio button for This folder and its contents are publicly viewable, then click Update. Note: This can be done with files as well. The Resources item is designated as Public. Zoom: The Resources item is designated as Public. Note: While the content can be viewed by those who are not members of the folder's originating site, the content cannot be searched for or viewed by those who are not logged into your institution's system. Prev: How do I allow all students to upload content to a selected folder? Next: What is the Resources quota?